scammers!!! beware!!! I paid for annual service,they are ignore me! no one signal!! !do not get fooled by their advertising!!! It has been 2 weeks and all I have received is an EA that works on DEMO account. LUCKILY I PAID THROUGH CREDIT CARD SO I CAN FILE A DISPUTE. POOR CUSTOMER SERVICE. REPLY ARE LIKE AFTER 24 HRS. SIGNAL QUALITY: Recevied 5 signals a week ago and all 5 trades are opened. WASTE OF TIME AND MONEY. No Refund provided nor the services are provided. 35pip.com are the biggest scammers on the internet. They sent me a few signals that were absolutely terrible ans then they just stopped sending signals altogether. I tried to contact them on numerous occasions with no luck.STAY VERY FAR AWAY FROM THEM THEY WILL STEAL YOUR"E MONEY!!!!!!!!!! thank you very much for great service and good signals. after installation through the support EA works fine now. 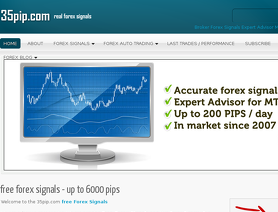 Really good service - supporting my personal trading. 100 % helpful service. thanks to the team for the personal advises. I did it, now it's your turn. not even a signal wayste of money .at least he gives back refund .but no signals.at all.